How Can You Tell if Your Senior May Be Having Trouble Hearing? Senior Care Germantown TN – How Can You Tell if Your Senior May Be Having Trouble Hearing? Your senior may not think that she has any trouble with her hearing, but perhaps you’ve started to suspect that there’s an issue. If you have, these tips can help you to narrow down what might be going on with her hearing. Telephone conversations can be difficult for a variety of reasons. First, there are different technological issues that can affect a telephone connection, especially when you’re talking about the differences between landline connections and cellular connections. Beyond that, your senior can’t rely on the physical and facial cues that she may be leaning on subconsciously. The telephone conversation forces her to rely solely on her hearing. Background noise can muddy up the conversation for anyone, but especially an elderly family member with hearing trouble. She may not realize that it’s happening more profoundly for her than it is for other people, however. What might be just a little annoying for you can be incredibly overpowering for your aging adult. 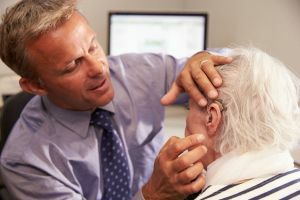 For a senior with hearing trouble, everyone else might seem to have the problem rather than her. In fact, you might start hearing your senior complain that everyone that she encounters mumbles and can’t speak clearly. She may even be able to hear that they’re speaking, but she’s unable to distinguish exactly what they’re saying. If your elderly family member turns the volume on everything up as far as she possibly can, she almost definitely has an issue with her hearing. The problem with this is that often increasing the volume gradually adds more distortion to whatever your senior is listening to. Correcting her hearing with a hearing aid or some other device can help to correct this. Someone with a hearing problem has a distorted sense of the volume they’re using when they’re speaking. So your elderly family member might talk much more quietly than she thinks she is, causing everyone who talks with her to ask her to repeat herself. On the other hand, some people overcompensate by speaking so loudly that they’re almost shouting. You can also ask senior care providers and other family members what they’re noticing. But the absolute best way to know for sure that your senior is in need of assistance is to have her hearing tested. Talk with her doctor about setting up a full test so you can know for sure. For Senior Care Services in Germantown TN, please contact the caring staff at Personal Care Services MidSouth today! This entry was posted in Personal Care Tips, Senior Care Germantown TN and tagged Senior Care Germantown TN. Bookmark the permalink.